Airmaster is a fan manufacturer that patented the first electrical fan in 1886. So, needless to say, they have a long history with fans, and they know how to produce a quality fan. This 42" air blower barrel fan is an epoxy coated metal barrel, with 3 aluminum blades. The overall unit weighs 120 pounds, and is mounted to a heavy duty base that has 8 inch steel wheels with rubber tires to move it around. 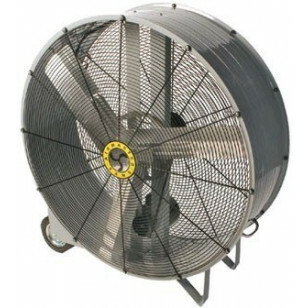 It is a great fan for moving large amounts of air in a straight line to cool people or products in the manufacturing process. If you're looking for a fan that can rotate to blow air up, down, or at an angle, we also have our 24 inch air cooling drum fan available. All of our barrel & drum fans cool large areas in no time. They work especially well in wide open warehouses, industrial settings, and especially manufacturing plants. This 2 speed stationary air blower barrel fan moves up to 14,000 CFM for maximum cooling. On its highest setting the fan only pulls 9.0 amps, so multiple fans can be plugged into the same electrical circuit. 8 inch wheels mounted on a sturdy frame allow you to easily move this 120 lb. fan from area to area. Air blower barrel is made from an epoxy coated metal, and the fan blades are made from aluminum. UL/CUL listed for safe use in manufacturing and industrial settings. This is a review for the Air Blower Barrel Fan.